A series of lucky breaks has allowed two University of California, Berkeley, astronomers to track down the identity of a distant star that lit up the majestic Whirlpool Galaxy a month ago. While astronomers can predict which stars will end their lives in a fiery explosion, surprisingly only five supernovas before now had been traced back to a known star, according to one of the astronomers, UC Berkeley astronomy professor Alex Filippenko. Most supernovas are too distant, or their progenitor stars too faint or in too crowded fields for astronomers to look back in historical sky photos in order to pinpoint the location and type of star. The Space Telescope Science Institute (STScI) today (Thursday, July 28) released photos of the beautiful Whirlpool Galaxy, M51, showing the location of the original star and the bright supernova just 12 days after its explosion was discovered. The supernova, dubbed SN 2005cs, belongs to a class of exploding stars called "Type II-plateau." A supernova of this type results from the collapse and subsequent explosion of a massive star whose light remains at a constant brightness (a "plateau") for a period of time. This finding is consistent with the idea that the progenitors of supernova explosions are red, supergiant stars with masses eight to 15 times the sun's mass. The progenitor star of SN 2005cs was found to be at the low end of the mass range for supernova explosions. Stars with masses lower than eight solar masses do not explode as supernovae at all, but rather blow off their outer atmospheres to become planetary nebulae before contracting to white dwarfs. A German amateur astronomer was the first to note the unusually bright star - perhaps a supernova - in M51, and he asked the staff at the Central Bureau for Astronomical Telegrams to post a note to that effect on June 29. Filippenko, who specializes in supernovae and black holes, received the notice late that afternoon and rushed to get one of his former students to request a spectrum of the brightly burning star from a telescope in Arizona. This spectrum confirmed that it was a Type II supernova. Filippenko, by chance, was at the very end of a year-long observational program using the Hubble Space Telescope, and he worked during an overnight flight and early the next morning to submit a request to observe the supernova before his opportunity ended at 5 p.m. Eastern time June 30. Since Hubble can easily resolve stars in nearby galaxies, such as the Whirlpool, it was the only chance he had to track down the exploding star's identity. 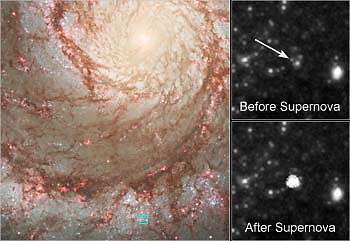 The new picture was needed for comparison with archival images in order to accurately determine the position of the supernova. He got in under the wire, convincing the telescope crew to observe the waning supernova on July 11, amidst the hoopla and frequent observations of the Deep Impact probe's collision with comet Temple I. "This will be one of Hubble's many legacies," Filippenko said. "No other telescope program could observe the exact location of this Type II supernova, yet it was an opportunity not to be missed." From the brand new Hubble image and a January 2005 image Hubble had taken of the Whirlpool Galaxy, UC Berkeley research astronomer Weidong Li and Filippenko were able to pinpoint the location of the progenitor star and identify it as a red supergiant whose mass is about seven to 10 times that of the sun. "This is a great example of the excitement of science, when something happens and you have to jump on it right away," said Filippenko, who is known for the enthusiasm he brings to teaching. "Some nights you just don't sleep." Filippenko, Li and colleague Schuyler Van Dyk of Caltech's Spitzer Science Center first reported their findings in IAU circulars 8556 and 8565 on July 3 and July 12, respectively. The team submitted a full paper describing their research to The Astrophysical Journal on July 18. The Space Telescope Science Institute is operated for NASA by the Association of Universities for Research in Astronomy, Inc., under contract with the Goddard Space Flight Center, Greenbelt, Md. The Hubble Space Telescope is a project of international cooperation between NASA and the European Space Agency.